YPSA organized a local level sensitization meeting on “Link Up: Better Sexual and Reproductive Health & Rights for Young People Affected by HIV” with the GOs, NGOs and Civil Society. 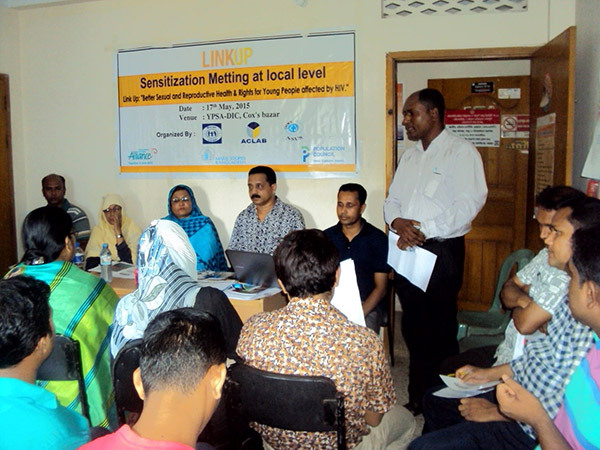 The meeting was held at YPSA-DIC, Cox’s Bazar on 17th May’2015 with the support of HIV/AIDS Alliance. This event was chaired by Abu Murshed Chowdhury, President of Cox’s Bazar Civil Society and Helenaz Tahera, Vice Chairman of Cox’s Bazar Sadar Upazila Parishad was present as chief guest. Md. Abdur Rahim Master, Chairman of Khuroskol Union Parished, Shampa Uddin, Counselor of Cox’s Bazar Pouroshova, Majum Nahar, Counselor of Cox’s Bazar Pouroshova, Ashim Barua, Health Education Officer-CS office, Advocate Mizbah Uddin, Cox’s Bazar District BAR, Dr. Shamim Ara, Kumkum Acharjee, Social Service Officer, Md Humayan Kabir, Asst. Youth Officer, Sujan Barua, PM of Marie Stops, Md. Sayedul Islam, PM of World Vision, Md. Jamal Uddin, CE of Noggar, journalists and representatives from other NGOs also participated in the Local Level Sensitization Meeting. Syed Assraf Ullah, Project Coordinator of YPSA-Link project introduced YPSA and presented the keynote paper on YPSA-Link Up project. Chief guest Helenaz Tahera said, “Cox’s bazaar is the most vulnerable area for Sexual disease especially STI and HIV. Besides, drug addiction of young people also the major problem here in Cox’s bazaar because of its country border and tourism area. Special thanks to YPSA in order to start the link up program in Cox’s Bazar to protect vulnerable youth. We will provide necessary support to YPSA for implementation of the project.